They Renew (Re-list) their good selling items over and over and over and over. Its really simple : When you Renew or Re-list your items, they appear higher in the search “hit” pages of people who are searching for particular subject matter. If I go into Etsy today and search for “Puppy Dog Painting”, then I will get pages and pages of listings for nice little dog paintings. The ones I see on the first search page are the ones that listed the most recently. So, if you Re-listed (Renewed) your puppy dog painting 2 times a day, you would probably capture the attention of every single person who was searching for those paintings. Obviously you don’t want to Renew 2 times a day, but you may consider doing it once or twice a week for sure. How often to Renew ? Who knows ? Experiment. Its only 20 cents per re-listing. Try to Renew once a week at first… and then try it once a day to see what happens. It depends on how much you are willing to spend, and obviously how many sales you are getting ! When you actually sell an item, it does get taken off your shop, so you do have to Re-List them after every sale. Go crazy…spend the 20 cents…Renew…Relist…Rinse…Repeat. Does Renewing on Etsy Work? An Experiment. It used to be that you could renew an item on Etsy and receive a bunch of views. Then they changed some things around in the caching process and Etsy got a lot more crowded. Maybe evil elves got involved. I don’t know. Point is, views received from renewing went down. Way down. Does renewing still work? I had to find out.First up, a little explanation. I am not a techie. Nor a great Etsy seller of astounding greatness and sales magnitude. Technical explanations tend to wash right over me like water off a duck that has been rolling in an oil slick on roller skates. So. Not a techie, not an expert. Moving on.Now, the parameters. I decided I would renew, list something new, or relist totalling 10 times a day for 30 days. – Why 30 days? Because things take time. – What defines the success of renewing? Ultimately, sales. Views and hearts are nice, but unless they lead to sales they’re meaningless.As you know, every time you renew something, it costs .20 US. It’s really not much…unless you do it a lot. By comparison, a Showcase spot will run you $7/$15 a day. (In my experience, I’ve never got more than a handful of hearts and 50 views from doing that. No sales. Not great. )I began on 12/28/09. *These stats are for the past 24 days, to keep things matched up. I was also featured in one Gift Guide. The item hasn’t sold, and it had been there for awhile. 12/29 – Listing/renewing 10 items a day is hard! Low views on the listings that don’t make it onto Twitter. (I use TwitterFeed to automatically send one listing to Twitter every 12 hours.) I’m scared this won’t work, but Dan encourages me to stick with it. Maybe there will be a cumulative effect. 12/30- Featured in a Chicken treasury. And then a Star Trek treasury later the same day. This after not being in any treasuries for months. 1/1 – Sold 6 items to a returning customer. Sweet!! 1/2 – Another sale, this time a Squid.ro (generally slow selling, just relisted 12/31.) Also in another treasury. 1/3 Another sale! Another new person. 1/4 – My South Bay hoodie guy gets featured in a Squidoo lens by someone I’ve never met before. Recently renewed items sometimes get new hearts. (Thanks, Statsy.org!) Older items do too, of course, but at a much slower rate. 1/5- Here comes a hiccup. I got word from the lovely lady of Regretsy that the pillows I made for the book were going to be featured on the site the next day. Listed 6 extra listings today for the Regretsy pillows, in anticipation of the article tomorrow. STATS: 271 sales, 1251 shop hearts at end of day 1/5. 1/6- Regretsy article posted. 278 sales, 1268 shop hearts at end of the day. 1/7- Featured in a treasury…the item featured was just renewed, but it was also tweeted, and the treasury was made by a twitter person. Also featured in another treasury about monsters. So 2 treasuries.The item in question was renewed 12/31. ALSO: Made it onto the Etsy front page…with a Blythe hooded capelet, which was renewed 1/4…it was in a special Etsy made treasury. 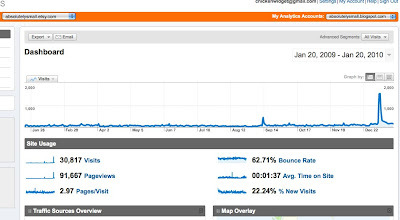 ALSO, ALSO: My spreadsheets were featured in the Etsy Success email, huge traffic boost to my blog. And also my shop apparently. Lots of new hearts, but so far no direct sales (yet!). The image they used in the email was one of my dogs…which was renewed on 1/6. 1/8- Small feature on an etsy blog that was new to me. Nice. 1/11-1/17- Sales slow to a crawl. Only 2 sales all week. 1 to a new person, 1 to an existing client. 1/18- Sold 2 items to a family member who I had just seen. 1/19- Sold 2 items…2 vintage items which were on the verge of expiring. 1/20- Honestly, not much has happened since the Regretsy/Etsy Finds email week. Renewing/listing 10x a day is a chore. I feel like I’m chained to the computer, as I need to renewed something basically every hour. Which means I have to stop whatever I’m doing, come back over here, and renew. And likely get distracted by something or other. And at 1 item every hour, I am totally chained to the computer ALL DAY. My productivity is way down. My internet shopping is way up. My Twittering is way down. (As are the hits coming in from it.) I am really not sure that this is working, and I am terrified to look at the bill. EXPERIMENT OVER! EXPERIMENT OVER! TOTAL DAYS OF EXPERIMENT: 24. So close! Now let’s look at some charts. Here’s the view of the month o’ renewing. The blue line represents this month’s traffic, the green line shows last month’s. Click on the images to actually be able to read them. Does renewing work to increase sales? For the first 9 days, it really seemed to. I was in treasuries! Sales from new people! After that (taking away the Regretsy/Etsy Finds days of debacle), things seemed to fall off entirely. This month wound up being far from average. Even if you take away the Regretsy & Etsy Finds numbers, views went up a little. Was this due to Twitter, blog posts, or other normal marketing efforts? It’s very possible. I do those things every day, and have been for a long time. 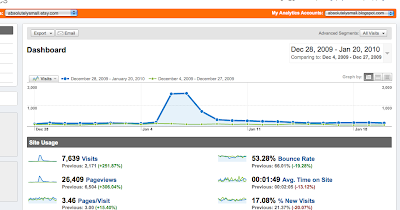 Looking at my Google Analytics data for the past year, I can see views very, very slowly picking up. If I squint. 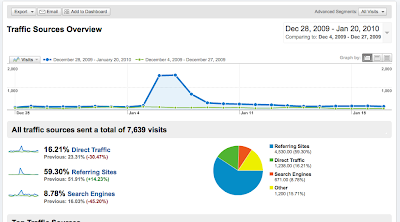 Interestingly, views coming in from Google itself went up by about 200. That’s got to be directly related to renewing. Over time (more time than a month! ), that could really be something. Bottom line: If your goal is to get into treasuries, then renewing works. Then again, so does hanging out in the forums and joining treasury teams. If your goal is increased sales…renewing constantly may help a little. But it’s going to cost you. Honestly, you can get better views on your items if you promote them yourself. You’d be better off spending your time and money developing a solid social network and marketing. Renewing alone is likely to be a disappointment. Renewing frequently as a short term marketing blitz might still be a nice injection of views and energy to your shop, however. Think of it as running an ad- seeing the same ad over and over and over again makes you block it out, if not actively hate it. On the other hand, a cleverly crafted ad run once in awhile for short bursts can make you pay attention. If you decide you want to try your own renewing rampage, go for it! And let me know how it works for you. Best wishes for you and your Etsy shop!